If you’re currently faced with a roof leak at your London property, you’ll want to get it resolved as quickly as possible. The last thing you want is water leaking into your property and causing even more damage than it has already. You’ll be glad to know it could be easier than you think to solve things when you use the services provided by Guttering Repairs Ltd.
We understand you need fast access to reliable London roofing services, and that’s where we come in. Take a look at the information on our website to see just how easy it is to get in touch with expert roofers and guttering specialists today. Whether you have missing tiles, an unidentified leak or something else entirely, we are here to help resolve the issue as quickly as possible. If your existing guttering isn’t up to the job, you could end up with additional problems caused by damp, mould and leaks. Regular gutter cleaning is vital to help your gutters drain away rainwater when necessary. 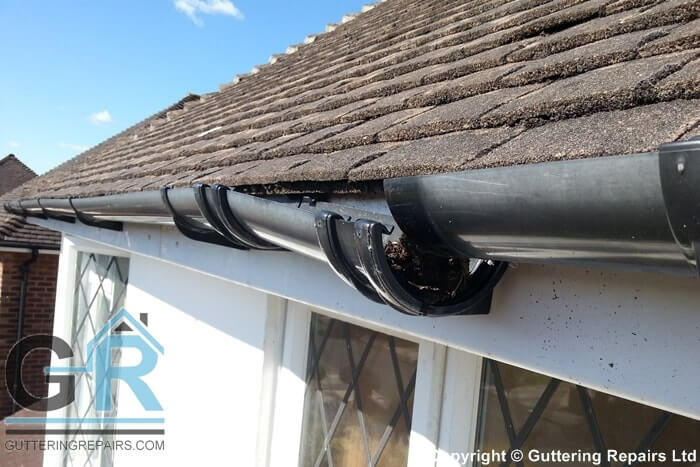 When gutters become clogged up with leaves and other debris, they cannot let rainwater flow into drainpipes and into the drains as easily as they should. If blockages become bad enough, they can prevent the water going down the drainpipe. This in turn causes it to spill out over the sides of the guttering and down the walls. Over time, it can cause damage to the outside of your property. Make sure this doesn’t happen to you by hiring an experienced expert offering London guttering services of all kinds. We can help you find the right person for the task. Guttering repairs and roof repairs aren’t just needed by people with their own properties. Commercial properties require regular maintenance as well. In fact, roofing leaks and guttering problems could be even worse for people with a business to protect. If the issue affects the property and makes it impossible for customers to enter the building, sales could well be lost. Fortunately, we have a large selection of London roofing companies and specialists close at hand. When you use our website, it takes the hassle out of looking for qualified roofing and guttering experts in the London area. Plenty of other business and private clients have already benefited from these services? Could you take full advantage of them too? Cost is very important when you’ve got a roof repair or gutter repair that needs doing. London services can be expensive, so you’ll want to know you can get a good price. The good news is we’ve even made this part of the process easy for you. Just complete our simple quote form to get a free quote today. Alternatively, you can give our team a call to get a quote for a London guttering or roofing job. Regardless of whether you need replacement or repair services, we can put you in touch with the very people who can help you. "Excellent service even though it wasn't an easy job due to the location of the leaky gutter. Terry kept me up to speed on everything along the way. Very friendly and helpful."